The Encyclopedia of Cloud Computing provides IT professionals, educators, researchers and students with a compendium of cloud computing knowledge. 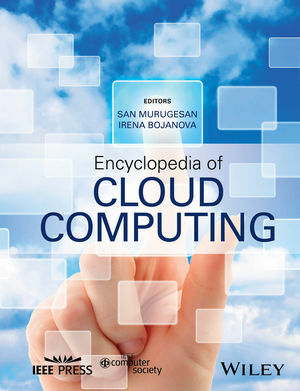 Authored by a spectrum of subject matter experts in industry and academia, this unique publication, in a single volume, covers a wide range of cloud computing topics, including technological trends and developments, research opportunities, best practices, standards, and cloud adoption. Providing multiple perspectives, it also addresses questions that stakeholders might have in the context of development, operation, management, and use of clouds. Furthermore, it examines cloud computing's impact now and in the future. The encyclopedia presents 56 chapters logically organized into 10 sections. Each chapter covers a major topic/area with cross-references to other chapters and contains tables, illustrations, side-bars as appropriate. Furthermore, each chapter presents its summary at the beginning and backend material, references and additional resources for further information. Irena Bojanova, PhD, is a computer scientist at the National Institute of Standards and Technology (NIST). She managed academic programs at Johns Hopkins University and PIsoft Ltd., and co-started OBS Ltd. (now CSC Bulgaria). She received her PhD in computer science / mathematics from the Bulgarian Academy of Sciences and her MS and BS degrees in mathematics from Sofia University, Bulgaria. Dr. Bojanova is the founding chair of IEEE CS Cloud Computing Special Technical Community, and acting editor-in-chief of IEEE Transaction on Cloud Computing. She is also a co-chair of the IEEE Reliability Society IoT Technical Committee, and a founding member of the IEEE Technical Sub-Committee on Big Data. She is an associate editor-in-chief and the editor of the Trends Department of IT Professional and an associate editor of the International Journal of Big Data Intelligence (IJBDI). She has served as general co-chair of the IEEE International Symposium on Software Reliability Engineering (ISSRE 2015) and general chair of the IEEE IT Professional Conference 2014. She writes cloud and IoT blogs for the IEEE CS's Computing Now (www.computer.org, accessed November 22, 2015). Dr. Bojanova is a senior member of IEEE CS and can be reached at irena.bojanova@computer.org.